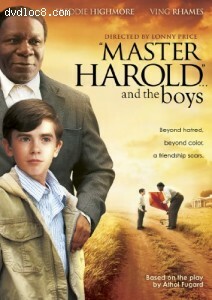 Synopsis: Freddie Highmore (Charlie and the Chocolate Factory) and Golden Globe winner Ving Rhames (Pulp Fiction) are unforgettable in Athol Fugard's searing coming of age masterpiece set in apartheid-era South Africa. On a rainy afternoon in his mother's tea house, lonely 17 year-old Hally and Sam and Willie, two middle-aged black servants, share idyllic memories of their lifelong friendship. But when Hally learns that his invalid alcoholic father is coming home from the hospital, he unleashes his resentment and rage on Sam and Willie with devastating consequences. Lonny Price, who portrayed Hally on Broadway, captures all the heartbreak and humanity of one of the most celebrated plays of our time.